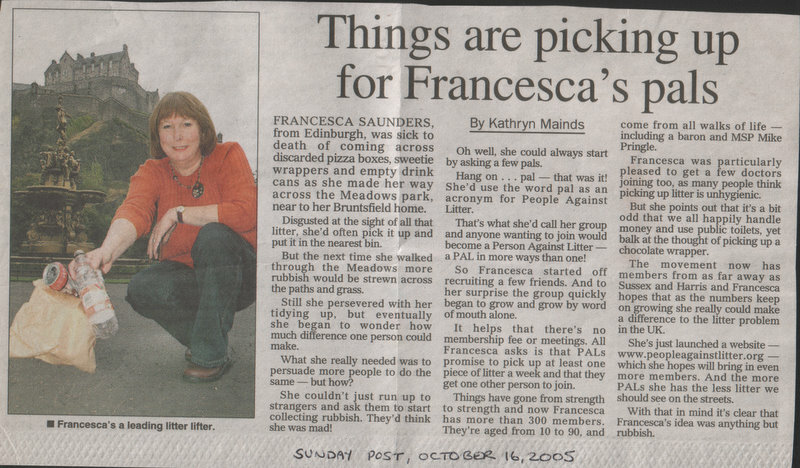 As Francesca Saunders made her way to work past discarded pizza boxes and empty cans of juice, she felt she needed to do something about the litter in Edinburgh. Her daily walk to and from work across the Meadows left her downhearted about the amount of rubbish blowing about the city’s parks and the streets. But instead of forgetting about it all when she got home, like thousands of others, she decided to act. Picking up a piece of rubbish or two on her own was not enough. But what, she thought, if she did just that – but also persuaded others to do the same. So, after talking to friends, she drafted a pledge form spelling out a commitment to pick up at least one piece of rubbish a day. 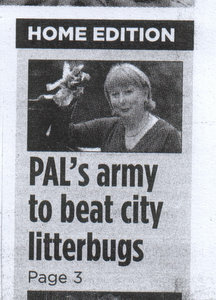 Calling her initiative People Against Litter (PAL), she also set up a website to spread the word to as many people as possible. The response she received, simply from word of mouth and e-mails buzzing back and forth between friends, has delighted her. Within months, more than 400 people had signed up to the PAL pledge. The vast majority are from Edinburgh, but her stand has also inspired people as far afield as Sweden, Germany and Australia. 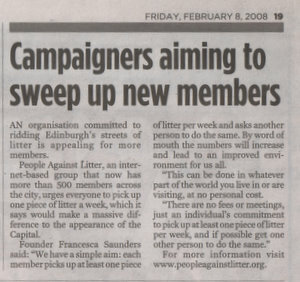 Although asking members to pick up just one piece of litter a day may not seem an ambitious target, Ms Saunders insists that if everyone does likewise it will make a massive difference. “Remember, Rome wasn’t built in a day,” said Ms Saunders, 55, a receptionist and administrator from Bruntsfield. “A thousand-mile walk begins with a single step. Only one person picking up one piece of litter would not make any difference, but if we could become thousands or millions then collectively we could effect a great change. “I live in Bruntsfield and walk to town fairly frequently and when I walk across the Meadows I see pizza boxes lying around. There’s so much litter I could have a full-time job picking it up. My husband Max and I travel quite a bit and it makes you shamefaced when you come home. In places like Paris, Rome and London I seem to notice a difference. “I had a think about how to get other people to pick up litter and came up with People Against Litter. It is not the sort of organisation that has official meetings and is completely free. PAL has the backing of community leaders who hope the idea will catch on. City environment leader Bob Cairns welcomed the work done by PAL and said an additional £1 million was added to this year’s street-cleaning budget.